Dr. Eric Karlstrom, emeritus Professor of Geography, California State University, Stanislaus, recently completed a 30-year teaching career. He taught physical and environmental geography courses, as well as courses cross-listed with the Geology department and an honors course. Throughout his career, Dr. Karlstrom has continued his research program in soils and geomorphology as means of reconstructing Quaternary paleoclimates. He is also the author or co-author of many earth science publications. Eric joins us to speak about his extensive research into an investigative series called, Is Crestone/Baca the “Vatican City of the New World Order?” An Expose of the New World Religion, which can be found on his website, 911 New World Order. Eric begins with a brief geographical sketch of the Crestone/Baca region, along with the reasons why he decided to delve into this inquiry. He talks about the radical contingent of environmentalists and Elites living in and connected to the area. He gives us a sketch of the key players in the UN’s global property rights regulations, adopted as soft law by 179 nations in 1992-1993, including Maurice Strong, the man behind Agenda 21. Then, Eric talks about the New Age Religion movement that has jumped on the “sustainability” bandwagon, their use of psychological warfare as a means of promoting depopulation, and the arrogant, chauvinistic mindset of The Chosen Ones. We consider the corruption of culture by the Jewish Elites and their secret societies, New Age religions ruled by Ascended Masters, the use of occult magic, and the controversy of Zion and the system of the Kabbalah. In the second hour, we discuss the New World Order and the creation of a new society out of the ashes of chaos. Eric talks about dangers of Tibetan Buddhism, the perfect religion to transition into the coming government that will take advantage of the “blank mind” of collective consciousness. Further, we get into the corrupt environmental movement, the protocols of Zionism, the Elite “custodians of the planet,” and geoengineering. We end with Eric’s take on the new epidemic of gang stalking, a worldwide program of citizen spying, and reflect on the importance of preserving American culture. 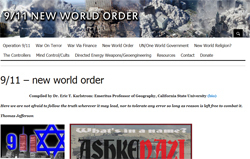 Gordon Duff – Veteran’s Today, MH17 & Obama the Anti-Zionist? This entry was posted on February 6, 2015 by Amir Alwani. It was filed under audio/podcast/radio, consciousness, esoteric, true culprits, tyranny, UN, world government and was tagged with Agenda 21, Zionism.